The morning was bright and sunny with a clear blue sky, but it was not forecast to last all day. We set off at about 9.30 for Stoke Hammond Lock a mere 100 yards ahead of our mooring spot. Nb Panther was just entering the lock and so we joined them. Stoke Hammond Lock with nb. Panther ahead. Once through the lock we headed for Willowbridge Marina for fuel. We had been advised that their price for diesel is quite high, but having missed the diesel boat Towcester the other day we needed a top up. Nb. Panther continued passed us whilst we fuelled, and we thought that was the last we would see of them, but a couple of miles further on we met again at Fenny Stratford Lock. By now the cloud was starting to build, and when the sun was hidden from view it was cold. 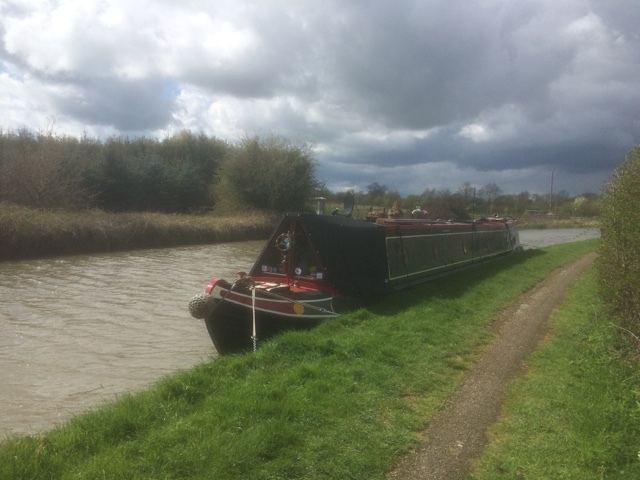 We continued rounding the outskirts of Milton Keynes and discussed the option of mooring directly outside the Black Horse Inn for lunch. As we round the final bend for the pub we saw the mooring was full, so as our intended spot was only a mile further, we carried on. Arriving at bridge 75 the wind was picking up. We quickly secured the boat and retreated inside to warm up. Not everyone was so lucky as this chap still had his lunch to catch. Rather him than me standing in the cold water. Our plan is to stay here one night and then move onto Cosgrove tomorrow. The crew informed me it is a bank holiday weekend, so we will aim to get there nice and early, to hopefully secure a spot before the weekend boaters turn out, especially as the forecast is for sunny weather. Today was a logistics day. 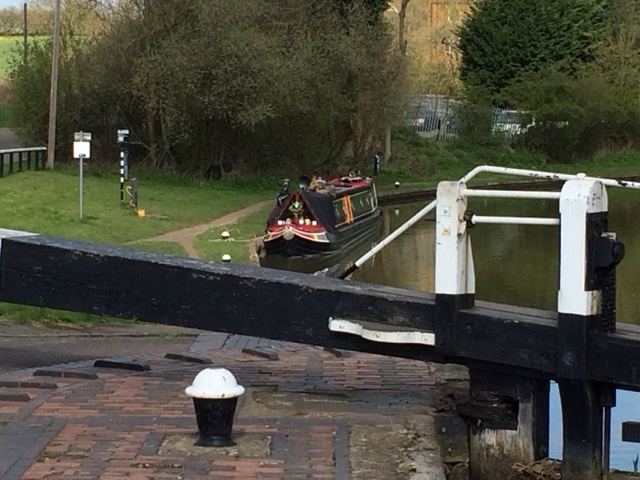 Ahead of our mooring spot were the three locks at Soulbury. Between lock two and three on the rise is a winding hole, and this would be the limit of our journey south this year. The morning was forecast to be bright and sunny so we set off after breakfast. At the foot of the lock flight is a water point so we filled up. Whilst waiting we also saw our first heron catching a fish. He was hovering over the pound, something must have caught his eye, then he swooped down, hopped out with wriggling fish in its beak, and then it was gone. It was also bigger than the ones I caught last year. Taking on water and setting the lock. The lock flight is manned by volunteers so we informed them of our intention to wind. The middle pound is adjacent to the Three Locks P.H. which we tried yesterday. It is dog friendly and serves good food, although did seem on the pricey side. Having winded it was back down the two locks, and back to our mooring spot above Stoke Hammond Lock. The weather is proving bizarre at the moment. One minute bright sunshine, the next wind and sleet. 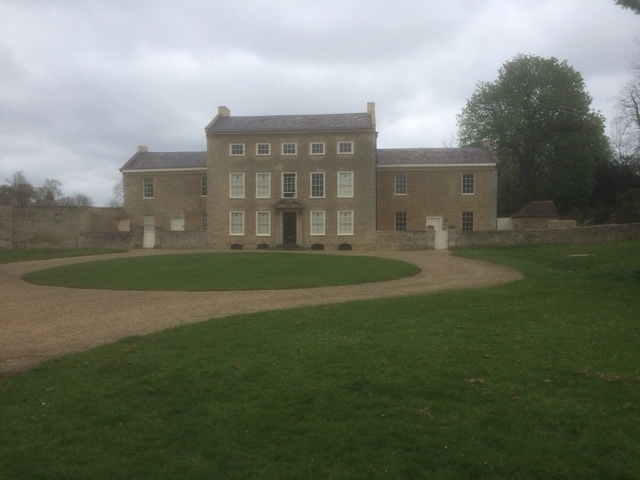 It is our intention, subject to the vagaries of the forecast weather, to set off for Milton Keynes and Great Linford tomorrow. This afternoon between wintery showers, the garden on the roof was tended to by the crew. Not wanting to be out done I thought I would tackle the stove. There was five months of baked on soot to clean, still now it's done. Today it was a flip of a coin as to whether to move or not. The forecast indicated we would encounter several showers, but that the wind would be light. Most of the journey would be spent circumnavigating Milton Keynes, however it was surprisingly rural. It seems the towns planners created plenty of parkland for the enjoyment of its residents. 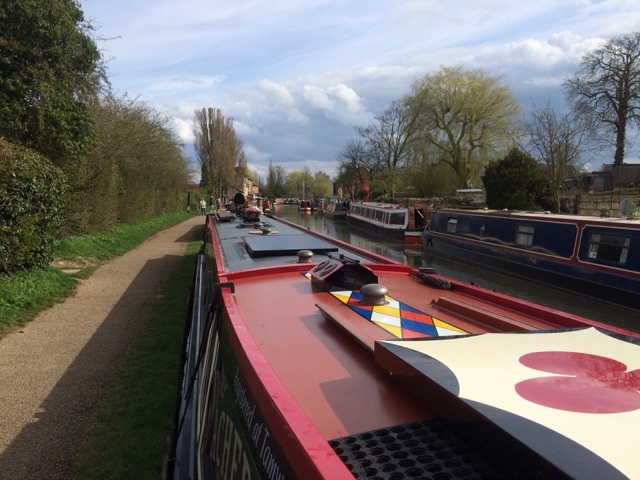 After a few miles we reached Fenny Stratford. The lock here has a change of level of one foot one inch. Whether this was a mistake by the canal builders, or planned is a mystery. 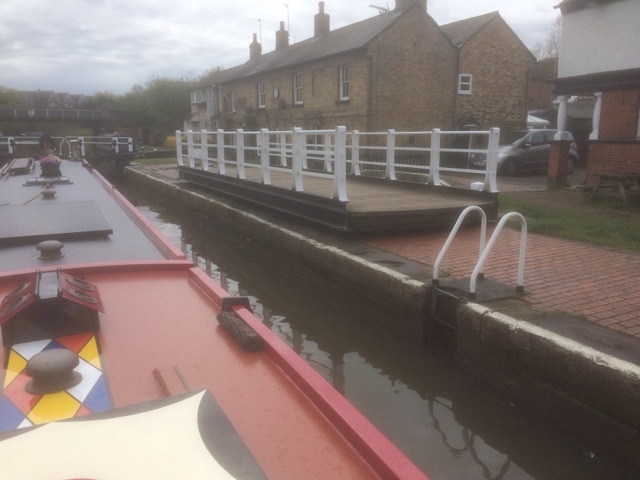 The lock also features a swing bridge, which must be moved before entry to the lock chamber. Fenny Stratford lock and swing bridge. Our next planned stop was to be Willow Bridge Marina for fuel, water and a pump out. The diesel pump was being repaired, so that will have to wait until our return. 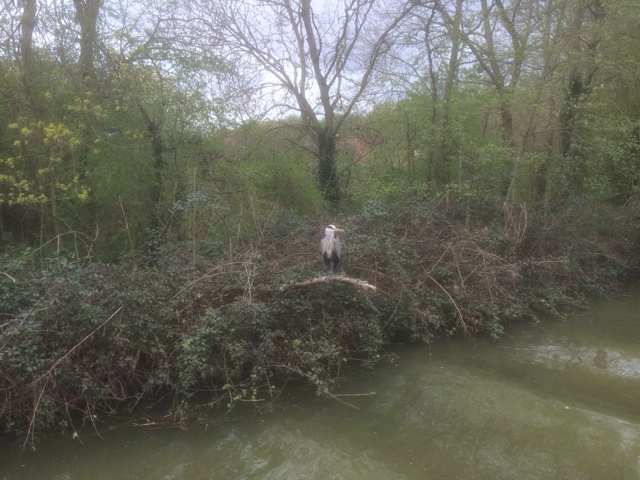 On route we spotted numerous heron, but this chap seemed to have a good fishing perch. From Willow Bridge it was only a mile or so to the lock at Stoke Hammond. We were joined by a singlehanded narrowboater for the ascent. Our chosen mooring spot was just above the lock with a nice wide grassy towpath. Not long after mooring up we were passed by nb Kantara, neighbours of ours at Yelvertoft. 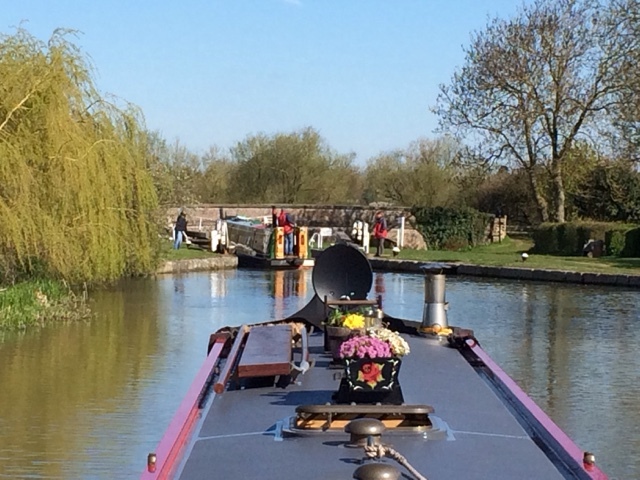 Kantara is on its way back from cruising London and their blog can be found in my blog list. We have good 3G and satellite signals here and are close to a couple of pubs so we are in no hurry to move on. 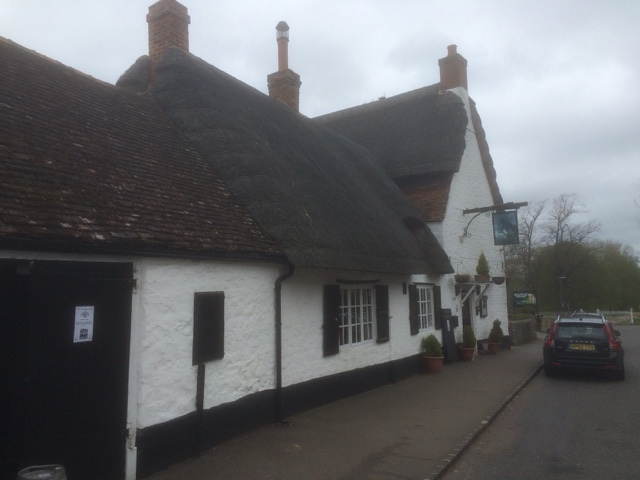 Just a short post today, to report that Sunday lunch at the Black Horse Inn was very enjoyable. The pub is very atmospheric with plenty of exposed beams and open fires. We also found out they are dog friendly so a visit on our return journey is very much a possibility. This evening the rain has set in so it was with some surprise we heard boat movement outside. Peeping out of the porthole we saw our first fat boat, aka wide beam on the move. 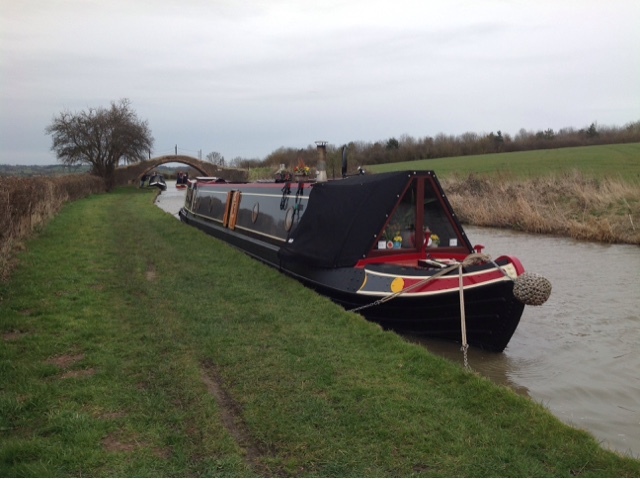 We have seen plenty of these moored up on the Grand Union but this was our first moving one, hence the quick photo. The weather for tomorrow is not looking too clever at the moment, so a decision on moving will be made in the morning. Not wishing to overstay our welcome at Cosgrove, on Thursday we set off, initially for Wolverton. We were now on the outskirts of the vast suburban mass that is Milton Keynes. At Wolverton located conveniently close to the canal, is both a Tesco and Asda superstore. Myself and Oscar remained with the boat whilst the crew took the shopping trolley on its first outing of 2016. A little over an hour later and we were on our way again. Our planned mooring spot was just two miles further on, by bridge 75. There were a few boats here already, but we found a boat sized gap to slip into. Our mooring is in a short section of the canal that dog legs away from the built up areas, and is surrounded to the north by parkland walks and several large lakes. Today, St. George's Day we wandered around these lakes, allowing Oscar to charge about in the park grassland, before returning to the boat for lunch. 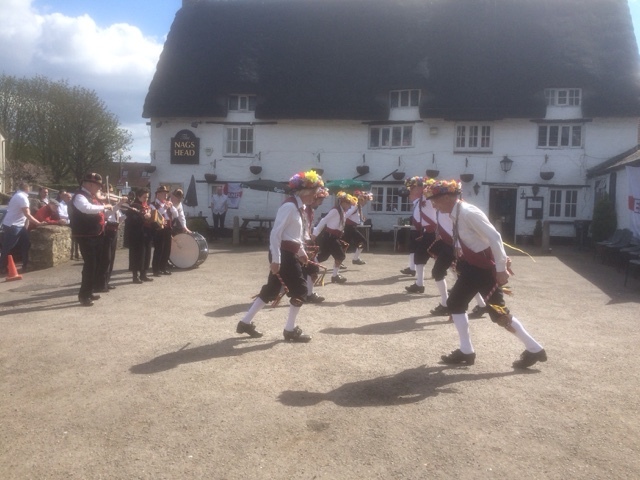 Our afternoon entertainment was going to involve returning to a pub we had found the previous day, on the edge of the medieval village of Great Linford. 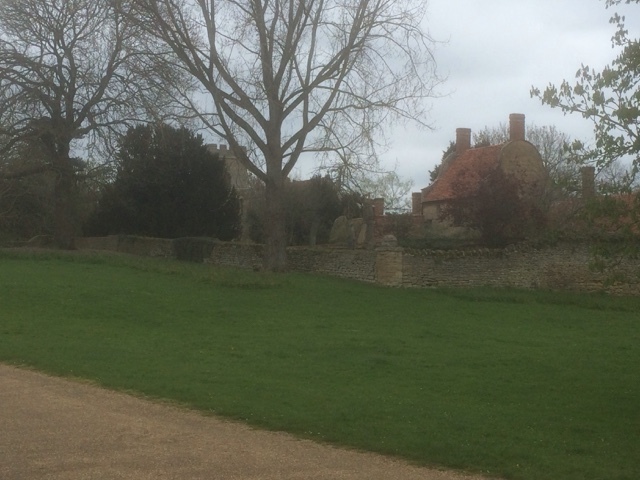 Almshouses and the 13th century St. Andrews Church. The Nags Head P.H. is a thatched roofed pub and today the building was adorned with flags and bunting. The entertainment taking place in the garden, was folk dancing by the Roses and Castles Morris dancing side. Roses and Castles Morris Side. During our excursions we have found another pub, the Black Horse, and this will be our venue for tomorrow's Sunday lunch. Our plan is to then move again on Monday, heading towards our final destination of Stoke Hammond, where we will wind to begin our journey back towards Yelvertoft for the Crick Show at the end of May. 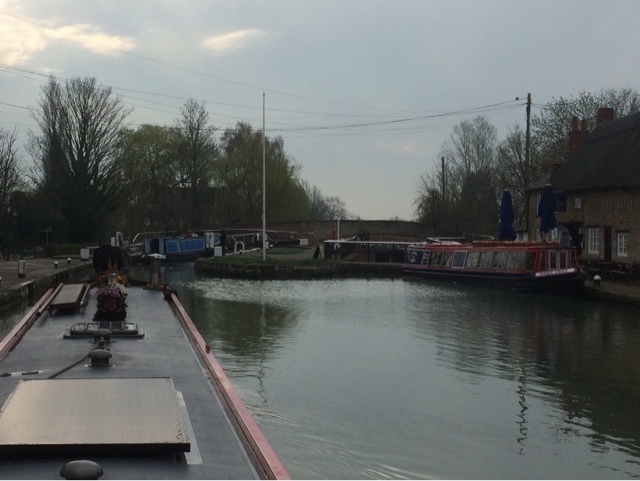 Yesterday we departed Stoke Bruerne having enjoyed its hospitality for the past few days. This culminated on Sunday with a three course roast dinner in the Woodwards restaurant above the Boat Inn. 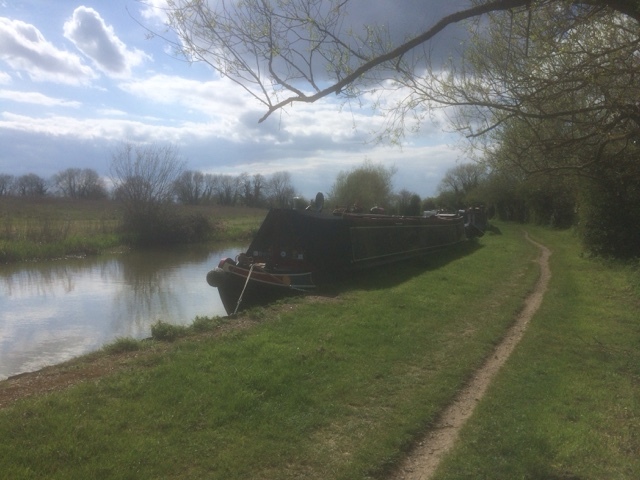 Although the weather was dry there was a cold wind blowing, but even so, as we descended the remaining five locks of the Stoke Bruerne flight, the crew removed their jacket with all the hard work needed. We met a few boats coming up, one being nb Ferndale, who informed us they read our ramblings. Once at the foot of the flight we pulled onto the service point for water. We had a bit of time to wait, so I cleared the roof of all its items and gave it its first ever wash, the roof that is. At the conclusion of our chores we set off again aiming for the village of Cosgrove. 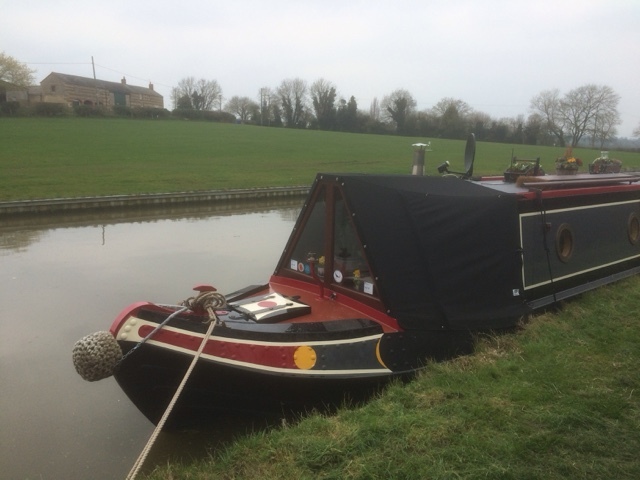 On route, we noted a number of good rural moorings in the vicinity of several villages, namely Grafton Regis and Yardley Gobion. Approaching Cosgrove we passed by the Navigation Inn at Thrupp Wharf, one for the future, then beneath a splendid Gothic style stone bridge. We continued and descended the single lock, then took up a mooring on a long straight section of the canal prior to the Great Ouse Aquaduct. 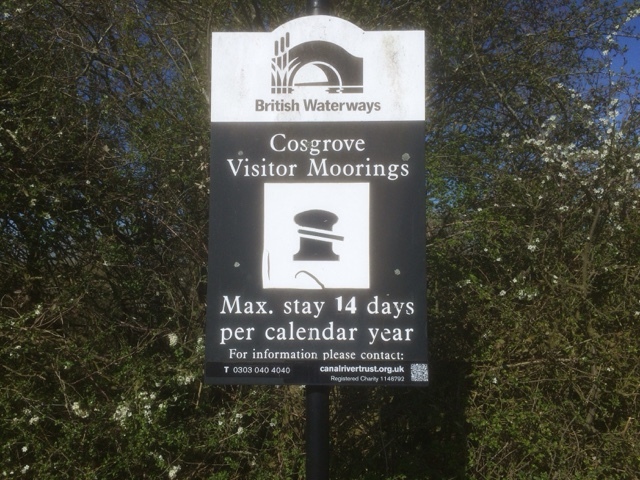 Cosgrove must be a popular spot as it seems we are time limited here to a maximum 14 days in any year. Today the weather was totally different, blue skies and warm sunshine. It appears as if the weather is forecast to remain fine for the next few days. This is good news as our solar panel is now providing upwards of 100 amp hrs per day, which equates to about two thirds of our daily electrical usage. After the winter months it's nice to have a spring clean, so this morning following breakfast, it was the turn of the well deck to be emptied of kit and washed. Soon it was lunchtime and we set off in search of the Barley Mow P.H. The pub is dog friendly so Oscar came too. The route was well signposted including directions through the ' horse tunnel ' beneath the canal. They must have used short horses in the day, as I nearly bumped my head in the centre as we walked through. After lunch we walked back to the boat via the very large Cosgrove holiday park. There is a handy grocery shop here that the crew informed me was well stocked. I had to wait outside for my ice cream, as the four legged member was not welcome inside. Then it was back to the boat. 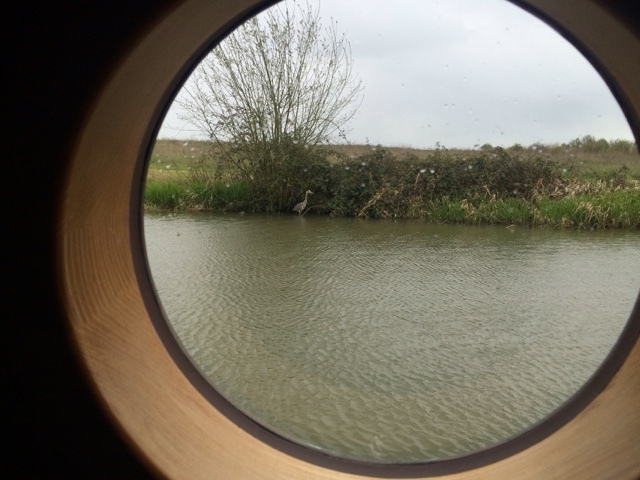 I had not taken a picture of our mooring so out came the camera, only to be photo bombed by a duck. Needing to stretch our legs a bit more we carried on walking in the direction of Wolverton. 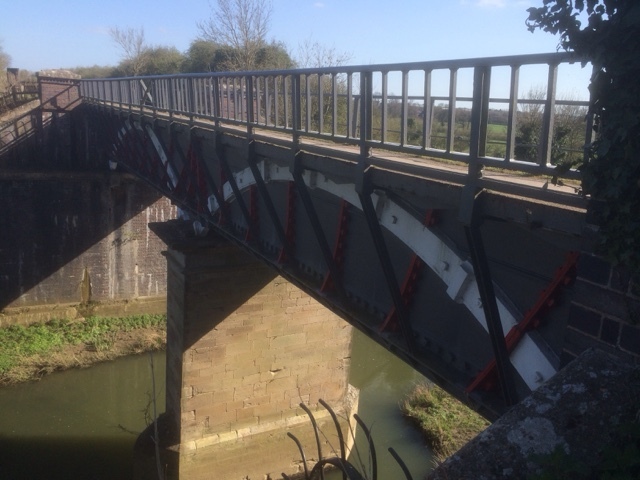 This took us over the oldest wide beam iron Aquaduct, which crosses the river Great Ouse. Prior to its building a series of locks down, and then back up the other side was the method of crossing the river. 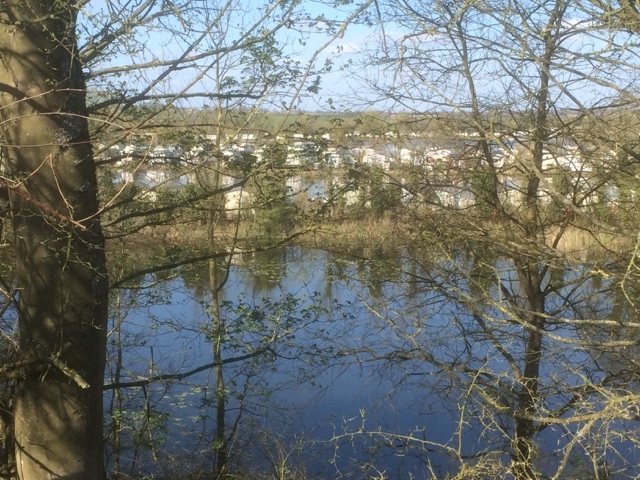 On our way back, viewing through the trees we could see the expanse of the holiday park surrounded by a number of large lakes. We will probably stay put another day before moving on, we don't want to use up our entire year worth of allowed time in one visit in case we want, or need to stop on the way back. Running total 47 Miles 40 Locks 3 Tunnels ( not including the twice through the horse tunnel ). At 0930 this morning we set off for the top lock. A boat had just passed us and we would join them for the long journey that lay ahead, ( 2 locks and about 400 yards ). Waiting in the pound with the Navigation Inn in the background. Once through the second lock we said goodbye to our locking partners as they headed off towards the remainder of the flight, and their eventual destination in London. The mooring in this pound is restricted to 7 days and is fairly shallow in places, but we managed to find a spot where we could get in, and also line up the satellite dish. We plan to stay here now until after the weekend. For lunch we visited the Boat Inn above the top lock, and then after we walked back towards the Blisworth Tunnel. The huts by the entrance are now put to use by a blacksmith, and also an artist creating stained glass items. We also spotted a novel use for any old shipping containers lying around......turn them into boats. It was then back to the boat before the forecast rain arrived, and to work out our itinerary for the next few days. Our new mooring at Stoke Bruerne. We had not planned to move today, but having finished breakfast at 1045 hrs, the sun was shining and the day was shaping up to be glorious. Initially we would aim for Blisworth but our plans changed. Soon after setting off, the canal wiggled its way back towards the railway line, which then stayed with us until we reached Gayton Junction six miles further on. 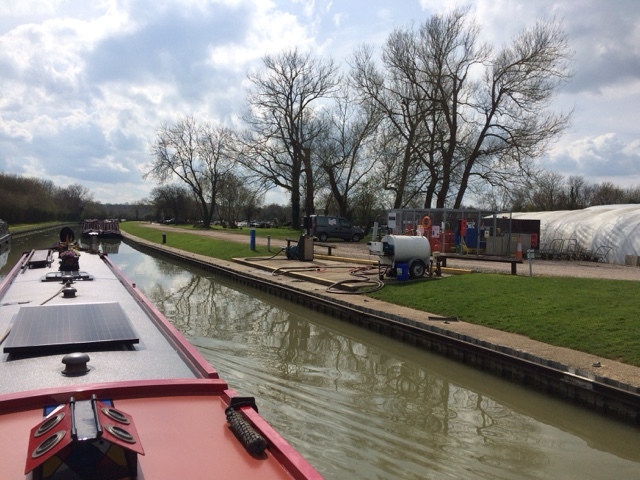 We needed diesel and a pump out so we turned left at the junction in order to visit Gayton Marina. After settling the bill we took the opportunity to fill the water tank, which in turn gave us time to have lunch. We continued along the Northampton Arm of the G.U. until we reached the winding hole at the top of the locks. This flight consists of 17 narrow locks, leading all the way to Northampton town centre some four miles away. At the terminus of the canal, navigation continues on the river Nene, pronounced 'Nen or Neen' depending on where you come from. This river eventually takes you to The Wash and the North Sea. Top of the flight with Northampton retail park in the distance to the left. We are currently not equipped for rivers, so we winded here, saving this route for another year. It was then back along the arm to Gayton Junction, turning left to continue our journey south. 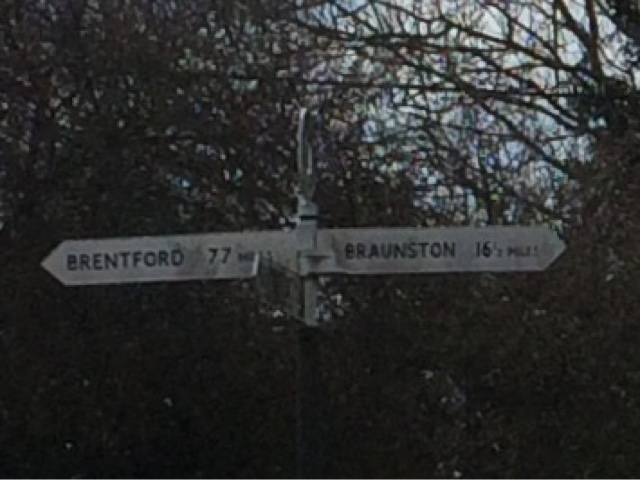 Junction Milepost, London only 77 miles away. After rejoining the G.U. mainline we said goodbye to the railway, and in no time were approaching our intended mooring location of Blisworth. It seemed however that Blisworth, had suffered some recent heavy rain as the towpaths looked like a quagmire. The four legged crew member is not very good at wiping his feet so we decided to press on. 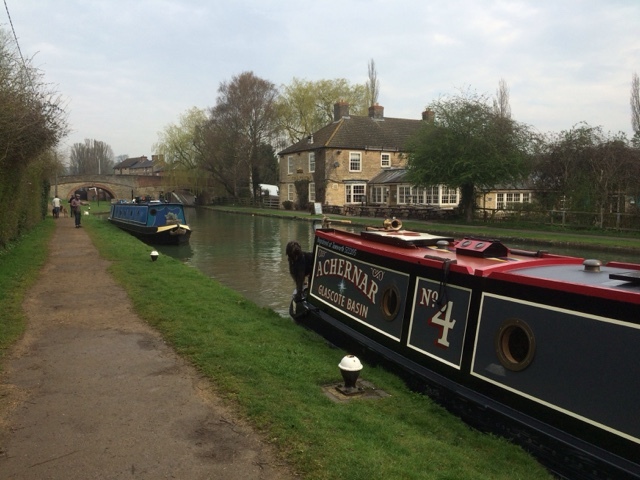 Travelling through Blisworth. Former warehouses now luxury flats. 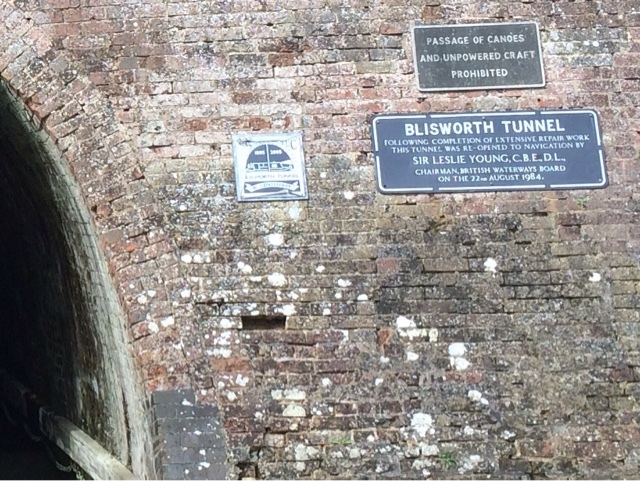 Soon we were entering the 3057 yards Blisworth Tunnel. This tunnel is the third longest navigable tunnel in the country. As we entered the north portal we could see the south portal ahead. This tunnel unlike some we have been through is arrow straight. We could also see that we had no oncoming traffic and so our passage only took approx 30 minutes. 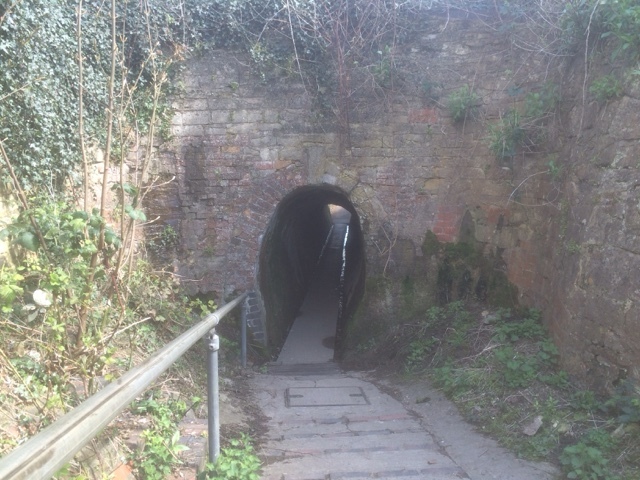 Approaching the northern portal of Blisworth Tunnel. The tunnel was fairly wet as we passed through especially in the area of the ventilation shafts, and at various point drainage channels were allowing water to pour in through the brickwork. The centre section of the tunnel was the subject of a massive restoration project in the late 70's early 80's and is now lined in concrete. As we exited the southern portal there is a plaque to commemorate its reopening in 1984. 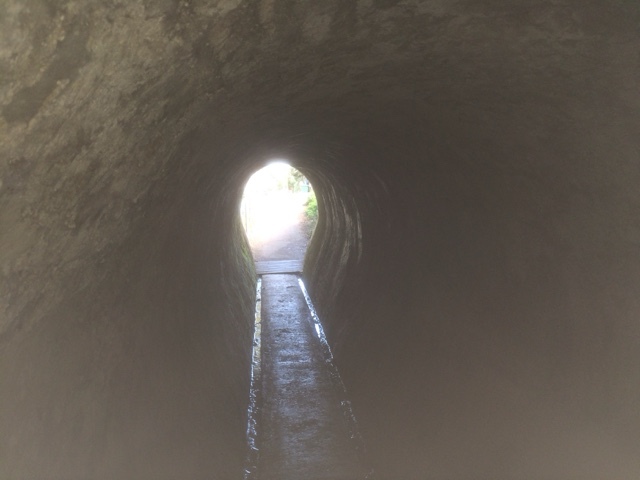 At each end of the tunnel is a hut originally used by the leggers, men who lay on a planks and walked the boats through, whilst the horses used to pull the boats nipped over the top. Thankfully for the crew, 43 horses of diesel power now does the job. We arrived at the famous canal village of Stoke Bruerne and found a mooring a hundred yards or so from the top lock. We are time restricted here to 48 hours, but will probably move down two locks of the flight tomorrow to the 7 day section. There are several pubs and an Indian restaurant here, all of which I am sure will benefit from our custom over the next few days. 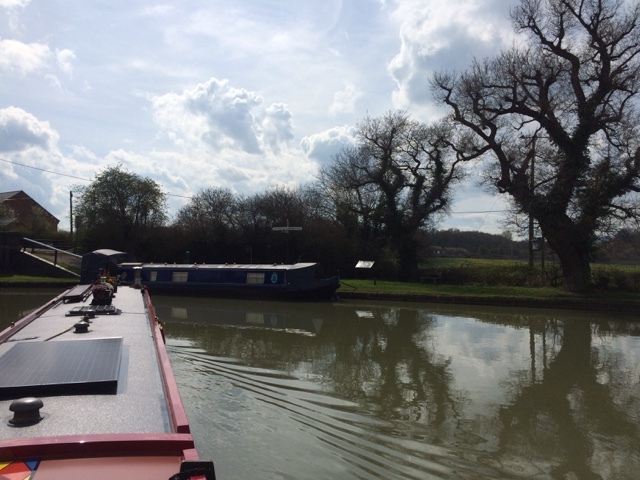 Our mooring at a busy Stoke Bruerne. We pulled away from our mooring at 0930 hrs and headed towards the lock. As we moved off another boat rounded the corner, we now had a locking partner. Unfortunately for the crew, this boat was single handed so not much help with the lock gate operation. 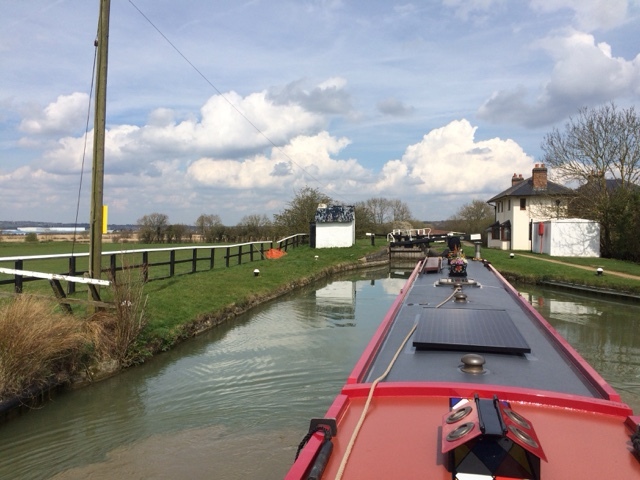 Having descended one lock the previous day, there were six more to go in the Buckby flight. I have been reliably informed by the crew, that these locks are heavy work. We met a few boats coming up, and just as we arrived at the bottom lock the volunteer lock keepers turned up, so we missed out there. 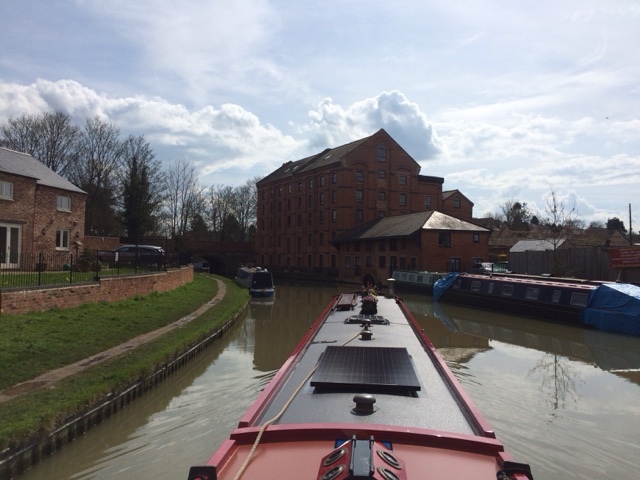 We pushed on, whilst our locking partner stopped at Whilton Marina to visit the chandlers. For the next mile we were sandwiched between the M1 and the West Coast Mainline, until just before the village of Weedon Bec, the motorway veered off away from the canal. We stopped by bridge 24 to allow the crew to visit the shops for supplies. There is a Tesco Express and, all important hole in the wall machine here. Now we continued on a bit further, stopping briefly for water near Stowehill Wharf, before arriving at our mooring spot just prior to bridge 28. We are now an equal distance between the villages of Weedon and Nether Heyford, but more importantly, far enough away from the motorway and railway. We will stay here a couple of days as it seems a nice rural spot but close to amenities. Mooring by bridge 28 between Weedon and Nether Heyford. Yesterday's trip to the New Inn for fish and chips ended with some amusement. During our time in the pub the level in the pound between the locks dropped over a foot. It had already been a bit on the low side, but this further drop had been too much for one of our mooring chains. It had snapped, and the base plate of the boat was 3 or 4 inches out of the water at the stern. 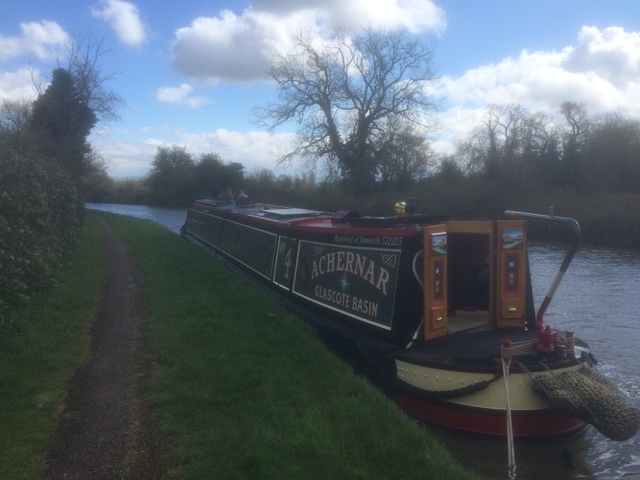 So, I collected a windlass and returned to the top lock to run a little water down, whilst the crew retrieved the remainder of the snapped chain and our mooring rope. It was during my absence the crew took their first dip in the cut. Fortunately, it was not a full immersion as they somehow managed to throw themselves onto the bank. Sadly, a photo opportunity missed. 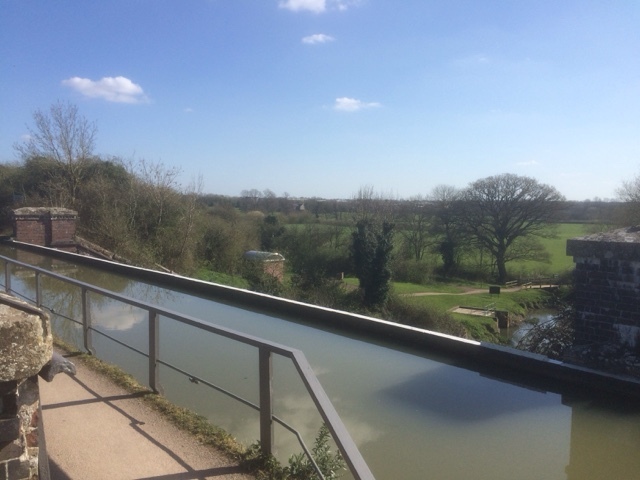 Today we walked down the flight of locks to visit the chandlers at Whilton Marina, replacing the broken chain and obtaining a spare. We also found a farm shop a two minute walk from the canal. It was very well stocked with fresh meats, sweet and savoury pies and some home baked cakes and cookies. All the produce is direct from the farm. We like to support these small canal side businesses, and this is close enough for us to visit by car when we are back at our winter mooring in Yelvertoft. 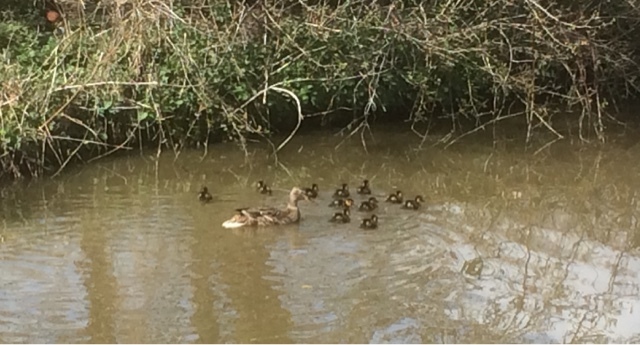 On the walk back we spotted a duck with her newly hatched ducklings, eleven in total. She will have her work cut out keeping control of that lot. Our route took us back passed the canalware shop and this time resistance was futile. I was relieved of my wallet and we now have a new flower box to adorn the roof of the boat. Finally, I thought we had moored in a 48 hr zone but it turns out we can stay put up to 14 days where we are. Not that we will stay that long but if the weather on Monday is unfavourable we don't have to move. 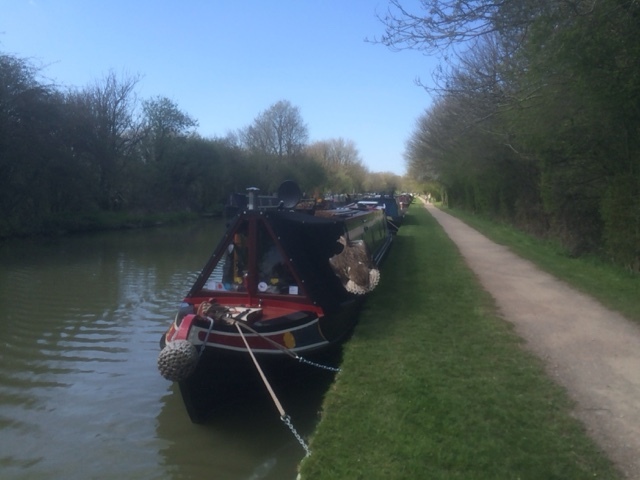 After spending a day in the wilds near bridge 100 on the South Oxford canal, it was time to move on. Now we have a functioning diesel heater we have allowed the squirrel solid fuel stove go out for the first time since November. At some stage I have the dirty job of cleaning the flue, but not today. Half an hour after setting off we turn right at the junction in Braunston, and headed slowly towards the locks. Initially we planned to go up one lock, then the crew was going to visit the village shops for supplies. However whilst waiting at the lock, we were joined by nb. Bluebird from Cropredy, and the prospect of help up the flight was too much for the crew to ignore. ( No visit to the butchers, means no steak or mince for me). 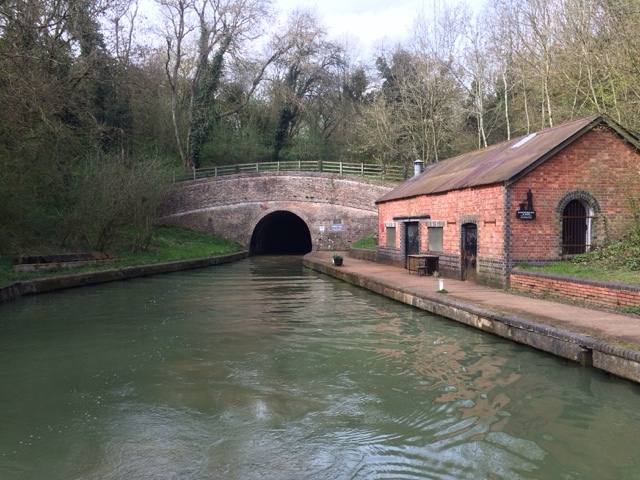 Through Braunston tunnel we encountered four oncoming boats, but none in the area of the kink so our passage was uneventful. At Norton Junction instead of turning left for home, we continued on towards the Buckby flight of locks. This is new water for the boat, and the crew. We stopped above the top lock for water, then descended one lock and took up a mooring close to some splendid willow trees. We are also located slap bang between the A5 on one side, and the M1 and West Coast Mainline on the other. Fortunately they are just far enough away as not to be a problem. Friday, being the day for fish and chips, may mean a visit to the New Inn later for tea. While there we may as well book in for Sunday lunch also. 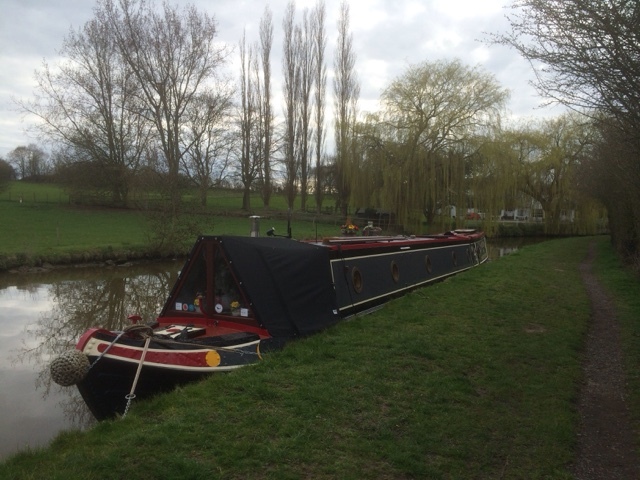 Our mooring at Long Buckby. We are time limited at this mooring to 48 hours, so first thing Monday we will be off. It's just as well as fifty yards ahead of the boat is a canalware shop with lots of expensive goodies for sale. 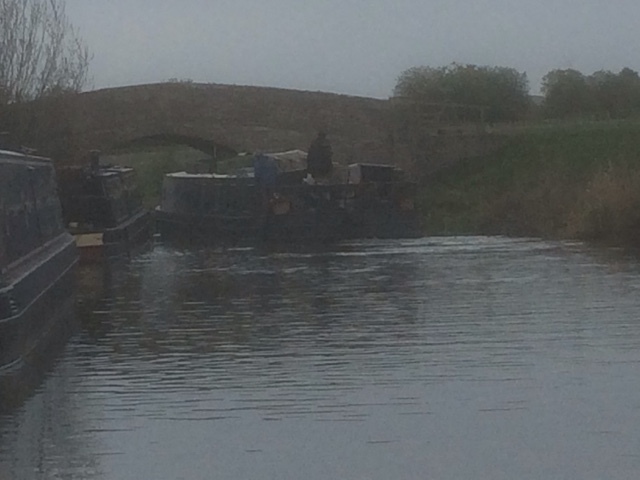 Our visit to Calcutt Boats is over and once again we are back on the cut. First thing Monday morning we moved our boat into the covered dock, and transferred a few things onto the hire boat that would be our home for the duration of the works. The accommodation was basic and not at all comfortable, the next few days would be an endurance. Later in the day the engineer notified us that he had made good progress, and that he would be finished the next day. This was music to our ears. Not only would the eye watering quote for the works not be so eye watering, but our stay on board 'Wild Hemlock 1' would be very much reduced. The following day, Tuesday, with a few hours to kill we took a walk around the reservoirs and headed off towards the Bridge Inn at Napton for lunch. 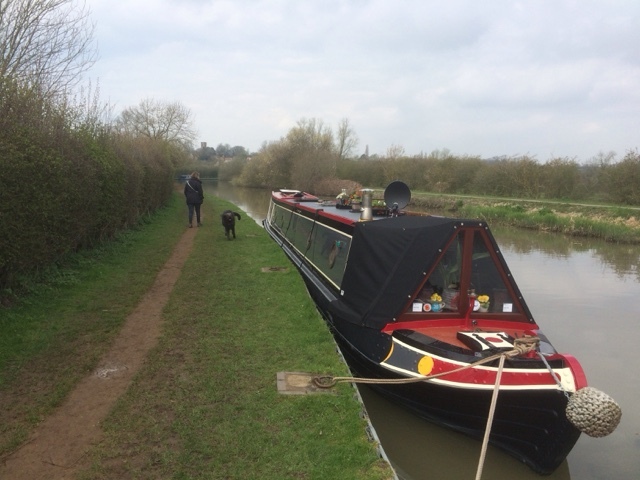 The pub was closed due to a funeral so we continued on along the towpath to one of our favourite pubs, 'The Folly' at the base of Napton locks. After lunch we wandered back to Calcutt Marina. 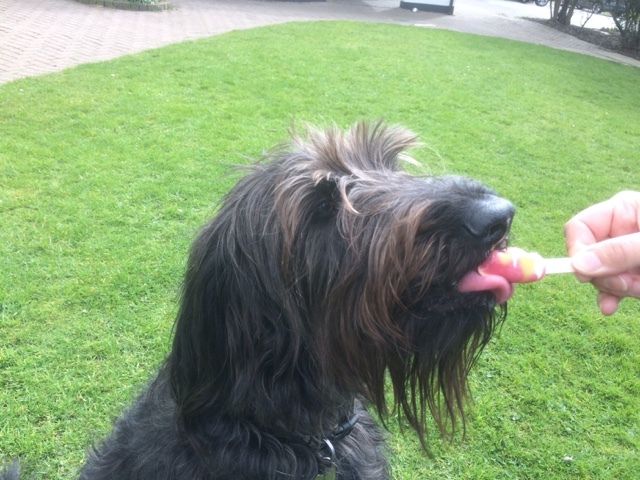 It was quite warm by now so the three of us needed an ice lolly to cool down whilst we waited for the engineer. The boat was ready. By now it was late afternoon, so rather than set off we arranged a berth for the night. 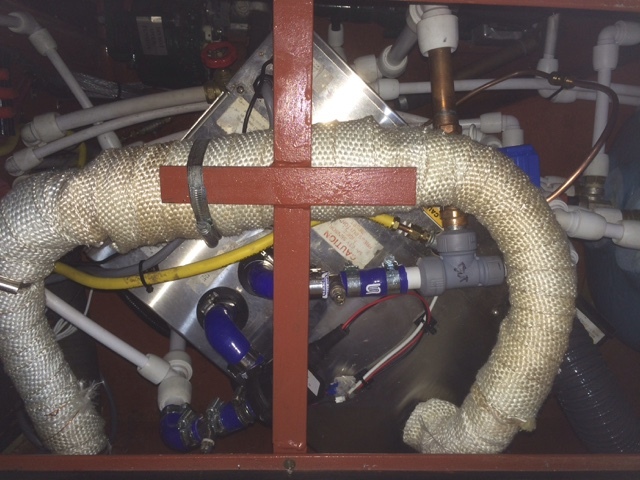 This would allow for a lengthy test of our relocated diesel heater before we travelled too far. It performed well. 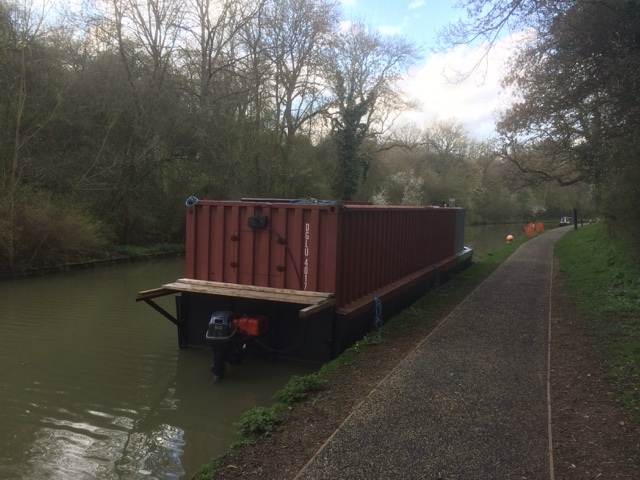 During the relocation the engineer has secured it to the boat using a combination of wooden boards and rubber feet. Previously, it had been secured directly to the steel of the boat. It now operates much quieter than before. This morning after breakfast we set off, departing the marina and headed up the flight of locks. The weather was fairly blustery, and there was a fair chance we would catch a shower before we reached our destination. Just as we were arriving at our mooring spot, the hail storm started. The wind picked up driving the hail sideways, and mixed in with the hail just for good measure was some icy rain. No sooner had we finished securing the boat the blue sky and sunshine made an appearance. We plan on staying here till Friday or Saturday depending on the weather. Hurricane diesel heater. Positioned at a 45 degree angle to allow service access. 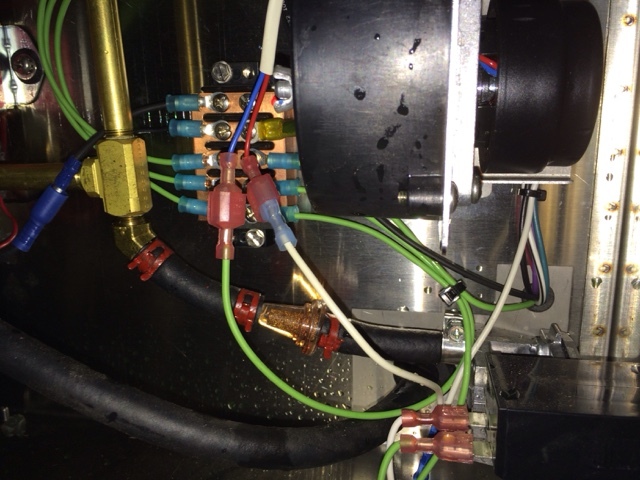 The inner workings which are now accessible. After spending a pleasant Saturday by bridge 100 it was time to move again. Today there seemed to be an increase in boat traffic, all heading towards Braunston. Just over an hour after setting off we arrived at Wigrams Turn where we rejoined the Grand Union Canal heading towards Birmingham. As we were entering the top lock another boat came into view in the distance, so we waited. It is far easier with two boats in these wide locks, and it saves water. There are three locks in the flight at Calcutt and the entrance to the marina is adjacent to the bottom lock. 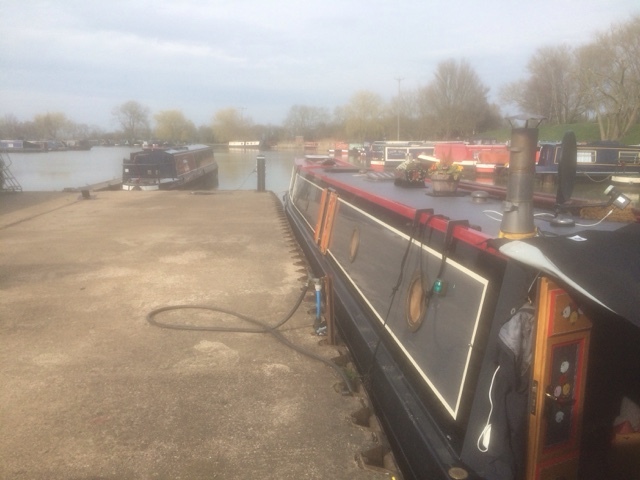 As we turned left into the marina and headed for our berth by the slipway, we spotted a very well known narrowboat 'James' moored against the 'dump barge'. 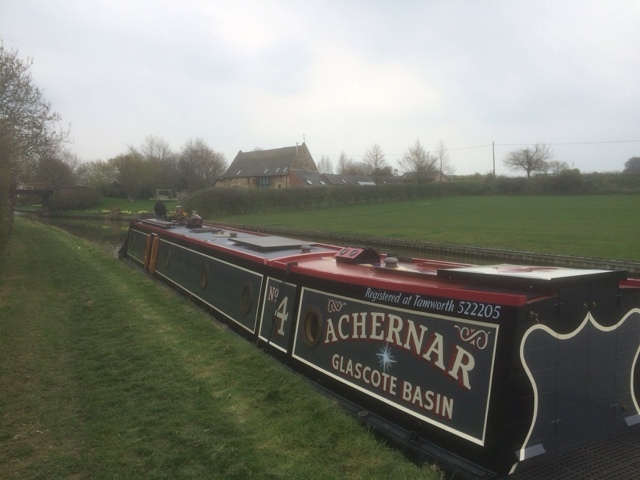 The owner runs a web site, living on a narrowboat, and operates taster days for people who want to try boating. We moored up and went to report in at the office. 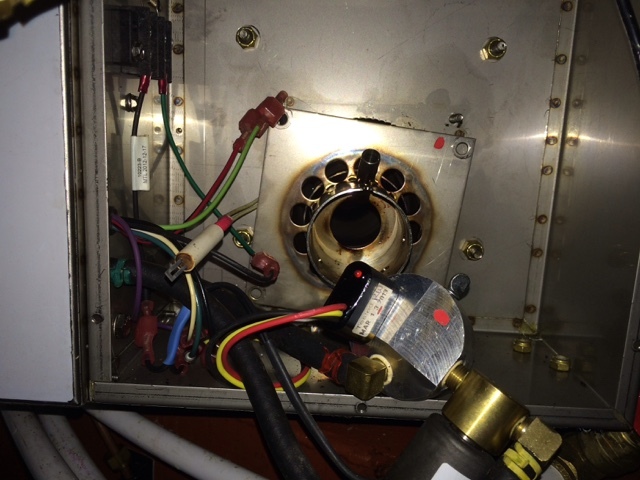 Later, the engineers who are going to refit our diesel boiler came to the boat to discuss what needed to be done. The good news is the work may only take a day and a half, rather than the three days originally quoted. Tomorrow, we move temporarily onto one of Calcutts hire boats, 'Wild Hemlock 1', whilst our boat goes into the shed. Our spot against the slipway with famous nb.James and the dump barge in distance. This morning the alarm had been set for a very early 8 am. The sky was cloudy, and the forecast warm weather had yet to arrive. After breakfast, we moved off towards the junction and turned right onto the main Grand Union Canal. 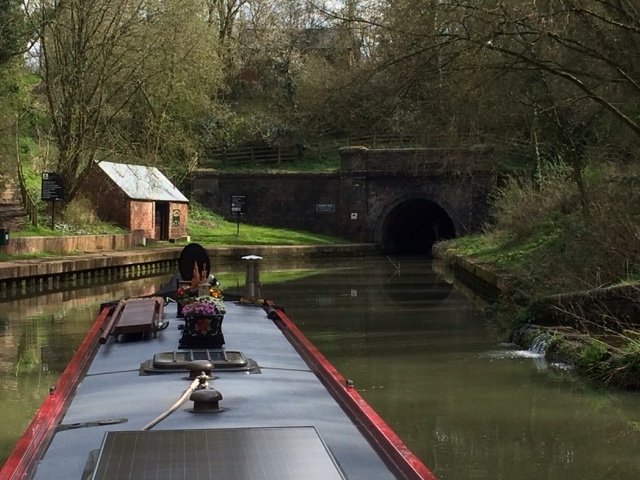 We passed a few moored boats whose occupants were still stirring as we headed towards the 2042 yard Braunston Tunnel. On the approach we could see a boat ahead of us entering the tunnel, and hoped these would be our partners down the six wide locks in Braunston. We negotiated the famous, or infamous kink in the tunnel without incident, and continued on without meeting any oncoming traffic. On arrival at the locks we teamed up with the crew of nb Lilly May for the descent of the lock flight. The owners had only bought the boat a couple days ago, and were on their way to the chandlers of some supplies. I was able to give them some good news that today, was freaky friday at the swindlers, and therefore everything was on 20% discount. We carried on to the junction and turned left onto the Oxford Canal. The wind by now was starting to pick up, but our intended mooring spot near bridge 100 was just over a mile away. Now, for the first time since November the boat is moored to the starboard side. If the warm weather forecast for tomorrow is correct, I will give it a wash. The plan is to stay put till Sunday, then we will travel the final leg to Calcutt Boats for our Monday appointment. Bridge 100 on the south Oxford Canal.